A Future With Out Poverty, Inc. seeks out artists living in poverty and provides them and their communities with resources they need to better their lives, including LALO, Inc.’s online platform and resources that allow these artists to share their talents with the world and financially support themselves and their families. A Future without Poverty, a 501(c)(3) nonprofit organization that works with communities to create opportunities, provide resources and empower people in a continual journey to eliminate poverty, and Let Art Live On,™ a company dedicated to the preservation of great art, are working to empower artists living in poverty. The Buy Art, Fight Poverty™ project provides artists struggling to make ends meet with the resources they need to sell their work and better their economic situation utilizing their own talents and hard work. 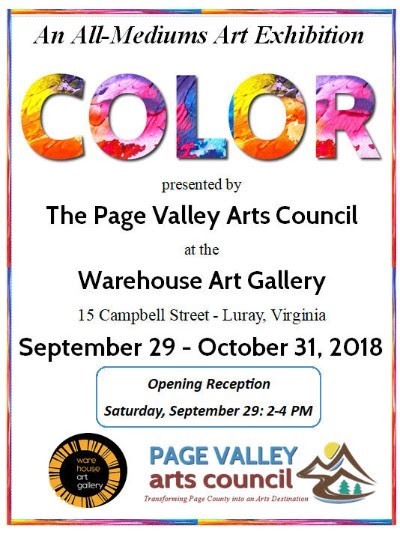 The Page Valley Arts Council is sponsoring an Art Show 29 Sept-31 Oct with the theme “Color”. It should be an interesting show and will include paintings, photographs, sculpture, stained glass, dolls, etc. There will be a free Artists’ Reception on 29 Sept from 2-4pm. We hope you will come! First the June event had to be postponed because of a Civil War re-enactment that did not happen. Next there was a problem with the air-conditioning at Brooklyns. Now that that is fixed, the Board is saddened to announce that the Summer Reception will be not be held. Our apologies to all Lalo members and friends who were asked to hold the date open for the event. Due to the Civil War re-enactment taking place on Main Street in Front Royal this coming weekend, we regret to announce the postponement of our 2018 Spring Reception. A new date has not yet been selected by the Special Events Committee head & LALO Vice President Jennifer Nicholson. “We are committed to going forward with this wonderful evening of art, music and food we had planned,” said Jennifer. “Watch for the new date – probably in July,” she added.